Ticket to Ride is easy to learn, yet players face strategic and tactical decisions that vary with every turn. If you only buy one game this is the one to get! This is the Ultimate Gateway Game with elegantly simple gameplay. A Spiel des Jahres Winner. 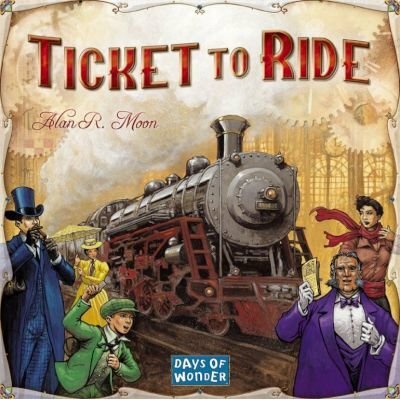 Ticket to Ride is a cross-country train adventure. Players collect cards of various types of train cars that enable them to claim railway routes connecting cities throughout North America. The longer the routes, the more points they earn. Additional points come to those who can complete their Destination Tickets by connnecting cities, and to the one who builds the longest continuous railway. Great for families and introducing people to the wonderful world of board games. Ticket To Ride is a must for every board game collection! You've got a Ticket to Ride!! Doesn't take long to figure out or play. No regrets on the purchase.